Volume 2015 (2015), Article ID 179689). Sporadic or non-hereditary cancers represent 85-90% of breast cancers and usually have unidentified environmental origins (only 5-10% have an inherited genetic origin). Some of these breast cancers can be attributed to life style choices (alcohol, trans-fats, obesity, lack of exercise) or gynecological factors (late first pregnancy, not breast-feeding, etc.). 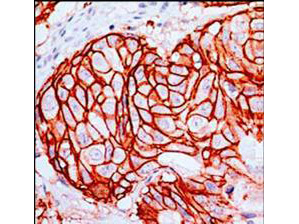 Anti-c-erbB2 Monoclonal Antibody (Rabbit) was used to detect c-erbB2 in human breast tumor tissue. Tissue was formalin-fixed and paraffin embedded. Staining requires boiling of sections in 10 mM citrate buffer pH 6.0 for 10 min followed by cooling at RT for 20 min. The primary antibody (cat. nr 900-C01-B37-C) was diluted 1:100 and reacted with tissue for 30 min at Room Temperature. A significant proportion of sporadic breast cancers are induced by hormonal treatment in women having a predisposition to this type of cancer. If detected at an early stage, breast cancer can be cured in 9 cases out of 10. Nevertheless, one of the difficulties of curing this disease is to identify the biological characteristics of each patient’s tumor. The usual first elements to further characterize breast cancer are the Human Epidermal Growth Factor Receptor-2 (c-erbB-2 / HER2) biomarker expression level (see HER2 Status | Breastcancer.org) and the Estrogen & Progesterone status levels (see Breast Cancer Hormone Receptor Status | Cancer.org). HER2 is a protein (encoded by the HER2/Neu gene) naturally present in the organism. This cancer biomarker is a transmembrane receptor involved in the regulation of cell proliferation. In some cases of breast cancer, HER2 is overexpressed on the cell surface, resulting in an uncontrolled growth and division of the cells. This is now systematically analyzed in Cancer Centers to know if patients can benefit from endocrine therapy and anti-HER2 targeted therapy. In parallel, the detection of well-known markers such as Mucin 1 (MUC1) is assessed too ( see “MUC1-C Oncoprotein as a Target in Breast Cancer; Activation of Signaling Pathways and Therapeutic Approaches” by Donald W. Kufe – Oncogene. 2013 Feb 28; 32(9): 1073–1081). This molecule is localized on the cell surface in 70% of the deadliest types of cancer including some particular breast cancers. Indeed, MUC1 is present in 90% of so-called triple-negative breast cancers, insensitive to hormone treatment. Research projects have also established connections between mutations in the BRCA1 and BRCA2 genes and some familial breast & ovarian carcinomas (see “BRCA1 and BRCA2 mutations account for a large proportion of ovarian carcinoma cases” by Pal T – Cancer. 2005 Dec 15;104(12):2807-16). BRCA1 and BRCA2 are known genes of susceptibility to breast cancer and ovarian cancers. These genes are described as “high penetrance” because they are associated with an elevated risk of developing breast and ovarian cancers in women who have mutations in these genes. In the general population, there is approximately 1 person out of 1,000 that has mutations in the BRCA1 and/or BRCA2 genes. There is an ongoing interest in improved early detection and prognosis, several multianalyte tests have been proposed for predicting outcome in patients with newly diagnosed primary invasive breast cancer, like MammaPrint or Oncotype DX. Also, recent studies have high-lighted RARA (Retinoic Acid Receptor α), aromatase expression or osteopontin as potential highly reliable biomarkers. In order to be able to identify and validate new cancer biomarkers, validated primary antibodies are required in the early stages of the pre-clinical research programs. Here are the most popular antibodies used by scientists involved in breast cancer research together with their validated applications. Looking for more primary antibodies for cancer research? tebu-bio offers a large selection of high quality primary research antibodies and guarantees them for their recommended applications. Leave a message here if you want to contact tebu-bio’s antibody experts to find the most appropriate antibody, protocol, positive controls… best suited to your needs. Rockland’s e-book for scientific excellence. This e-book enlist numerous expert tricks related to the selection or primary and secondary antibodies, some general beench tips (diluting antibodies, Protein-A/G immobilization, Biotin/Streptavidin reactions…) and technical tips for Western Blot, Flow Cytometry, Immunofluorescence Microscopy, ChIP, Immunoprecipitation, ELISA and for TrueBlot®reagents to obtain clean Immunoprecipitation / Western Blot results. Thanks to Xavier Faussadier for his help in the writing of this post dedicated to Breast Cancer research antibodies.